04 Dec Phlebotomy or Phlebotomoney? The healthcare field is ever trending upward, with several opportunities for career growth. Many people choose the healthcare field specifically because of these career opportunities, and many, like you, choose to begin their careers as a phlebotomist. In order to become certified in phlebotomy, an individual must take several classes in Westminster, California. Once you are certified, your career choices don’t stop at being a phlebotomist. There are several other career paths you may choose if your interest in phlebotomy grows after you get certified. Let’s say you have just finished your phlebotomy certification somewhere like Westminster. Your next step may be considering some career path options that involve what you’ve learned in your classes. 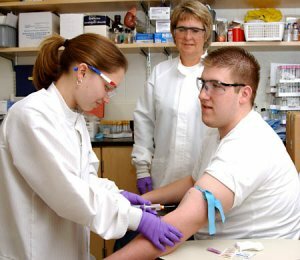 Some career paths of phlebotomy-certified individuals include: nursing, medical assisting, physician assisting, EKG technician, and medical lab tech. The salaries of these careers range between $29,000 and $100,000 a year. Keep in mind that each of these career options beyond phlebotomy requires more classes and sometimes more schooling. Even though these possible career moves require more education and/or licensure, your employer may be willing to help cover the costs since you will become more valuable and marketable with your increased training. Also, since you will already be a phlebotomy technician, you can work and earn a good income while attending school, which will save you from a lot of student loan debt. If an individual decides to stay focused on the isolated subject and become a phlebotomist, the average salary for a phlebotomist is $31,410 a year. This isn’t the highest paying phlebotomy related career, but it’s not the lowest either. The average phlebotomist salary in the United States is $33,424 as of October 31, 2018, and the range typically falls between $30,106 and $37,337 (The average phlebotomist salary in California is $36,473 as of September 28, 2018, and the range typically falls between $32,849 and $40,740) according to Salary.com. Medical Assistant. A career as a medical assistant is another option for individuals certified in phlebotomy. Medical assistants commonly work in various offices, such as physicians’ offices. Medical assistants make an average of about $29,370 a year. This is just slightly less than a phlebotomist makes, but the duties of a medical assistant are more versatile than that of a phlebotomist. EKG (electrocardiograph) Technician. EKG tech careers focus on the study of cardiology. The duties of an EKG technician include performing stress tests, recording EKG readings and then providing EKG test data to physicians. The average salary of an EKG technician is just under $50,000 a year. Medical lab Technician. Medical lab techs work in a laboratory. They draw blood, and are also able to analyze the blood to help diagnose patients. Medical lab technicians require an associate’s degree or certificate program to get their licenses. Because of your phlebotomist experience, your classes will be easier and you will be able to enhance your resume. As of October 31, 2018, an average medical lab technician salary was $51,315, and the range typically falls between $45,947 and $56,350. Nursing. Another high-paying career involving phlebotomy is nursing (LPN or RN). If an individual pursues taking classes at nursing school after a series of classes in Westminster to launch a nursing career, he or she should expect to be making a salary of around $68,910 a year. Nursing requires much more schooling and more duties. Becoming an LPN takes one to two years, while becoming an RN takes two to three years. Both programs are demanding, but again, your experience from being a phlebotomist will come in handy with your coursework. Physician’s Assistant. The highest paying career involving phlebotomy is a physician’s assistant. Physician’s assistants earn about $90,930 a year. Becoming a physician’s assistant requires much more schooling than the careers mentioned previously. This required schooling includes earning a specialized degree. Duties of a physician’s assistant include examining and treating patients, practicing medicine on a team under a physician or surgeon’s supervision and much more. Those are just a few options. As you can see, with every career possibility there is an opportunity cost. No matter what the opportunity cost, you can rest assured that there is a career best suited for everyone certified in phlebotomy looking for the next step to take from Westminster to the East Coast.